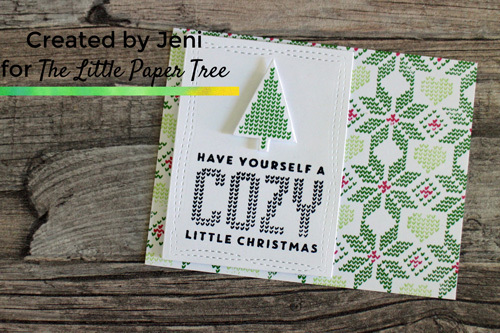 HI, it’s Jeni with a video tutorial that is part of the Save The Crafty YouTuber video hop. If you came here from YouTube I hope you are enjoying the video hop and have come to The Little Paper Tree’s tutorial blog for more inspiration. And if you regularly come to the blog – welcome back. You can watch the video I created on YouTube by clicking HERE or read on and watch the video tutorial below. We are also giving away a £20 Gift Voucher for The Little Paper Tree to one lucky person. There are over 125 prizes up for grabs so make sure you watch all the videos and leave a comment with either USA or INTERNATIONAL on each video. (You do not need to comment on every video – but the more you comment the more chances you have to win). There are also 50 prizes that will randomly be given out during the hop – so make sure you comment on all the videos! Comments must be left by November 7thand the winners will be announced on Justine’s blog on November 10th. Now onto the Christmas card. All the products I used are listed and linked at the bottom of this post. Originally I was going to use the background that was stamped with Party Dress and Something Borrowed but I felt the colours clashed too much with Grass Skirt. So I stamped another panel of white card – in landscape instead of portrait with Grass Skirt ink. I learnt to knit a few years ago so know that the V’s in the pattern point downwards. I stamped with little fill in pattern with Party Dress, again making sure that the V’s went in the same direction as the poinsettia pattern. I did consider using Something Borrowed for this stamping. I stamped three of the knit trees in Grass Skirt and diecut them all out. I was planning on only using one tree for this card but wanted to have a couple others just in case I decided to add more – and I can save them for another card. I stamped by sentiment on a diecut Wonky Stitched rectangle. There was still too much white space for me, so I took the small knit heart from the stamp set and stamped in the spaces between the pattern. I tried to use Something Borrowed ink and tested this colour on a part of the card that would be covered. I went with Garden Party ink as it gave a softer feel. The rectangle and tree are both popped up with some foam squares. I adhered this to an A2 standard sized card base and it’s ready to go. I did consider adding some Nuvo drops or sequins but I don’t think this card needs any bling. What do you think? Don’t forget to leave a comment over on YouTube for your chance to win a prize! Comments must be commented by November 7th and you must indicate if you are USA or International. I hope to see at our Facebook group – The Little Paper Treehouse Tribe, and hope you will share your card making creations (and other paper crafts) with us. I love the way this turned out. It was interesting to see your decision-making process. I agreed with all the selections; your card turned out great.